If you are driving a car, what should you do when following another vehicle in wet conditions? If you are driving a car, what should you do when following another vehicle in wet conditions? You should double the normal following distance, to be safe. This means you should use the four-second rule - count four seconds between a point on the road that the car in front passes until you pass that point. If you're driving a heavy vehicle or towing a large trailer, you should increase this time further. If you are riding a motorbike be aware that white lines can be extremely slippery when wet, and any oil and surface grime will lengthen your braking distance. If someone is following you closely, you might want to back off even more to give some extra buffer. A vehicle ahead of you will kick up spray if the rain has been heavy. This is especially problematic with older heavy vehicles that have less effective aerodynamics and mudflaps, and vehicles towing large trailers. In heavy spray the vehicle ahead of you will have reduced visibility of you, too, as the rear window could be covered in water. If you are driving through deep standing water then you will need to dry your brakes or they will provide very little braking power. Assume that other vehicles haven't seen you, and use your lights if the spray is heavy. You can see in the following video how quickly vehicles in the fast lane disappear into the spray once they've overtaken. Try to avoid driving near the edge of the road as you are more likely to get a puncture in the wet because the kinds of sharp objects that get swept to the road shoulders or run down the cross fall in the rain are more slippery and can penetrate the tyre rubber more easily. Wet roads when it's sunny can cause problems with glare if you are driving towards the sun. 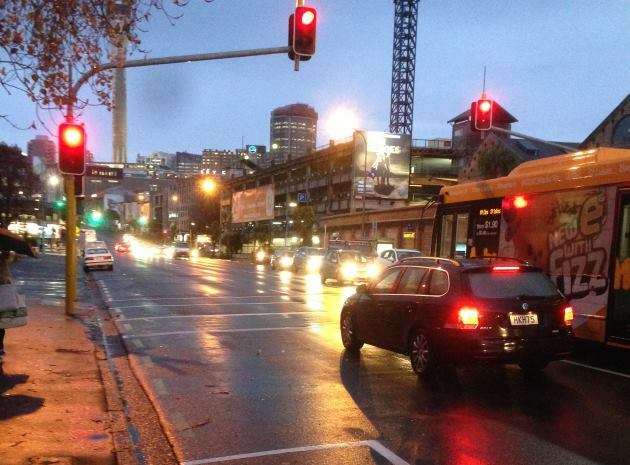 At night wet weather can make it even more difficult to judge the distance and speed of traffic, as you can see in this photo, which is at dusk on Victoria Street West in Auckland.